Fresh greenery/evergreens can be found in your own garden or purchased from a local garden center. The most common evergreen cuttings you can use for holiday decorating are Pine, Junipers, Cedars, Firs, Spruce, Ivy, Holly, Mountain Laurel, Boxwood and Magnolia. Other lasting decorations include pine cones, seed pods, winterberries, dried hydrangea flowers, dried leaves, Red Twig Dogwood and Curly Willow branches. (I encourage you to not use Oriental Bittersweet in decorations as it is on the New England invasive plant list). When cutting evergreen branches off of trees and shrubs, use clean, sharp pruners to prevent disease or fungal spread. With store bought greens be sure to cut 1/2 inch off of the bottom of each stem at an angle. While cutting branches and also creating your arrangements, wear water proof garden gloves or kitchen rubber gloves to keep any branch sap from getting on your hands. Sap isn’t easy to wash off. With a hammer, crush the cut branch ends of all greens and put into water immediately to absorb moisture more easily overnight or until ready to use. If the greenery will be kept in water for more than a few days, add a packet of florist floral food to prevent bacteria from growing. 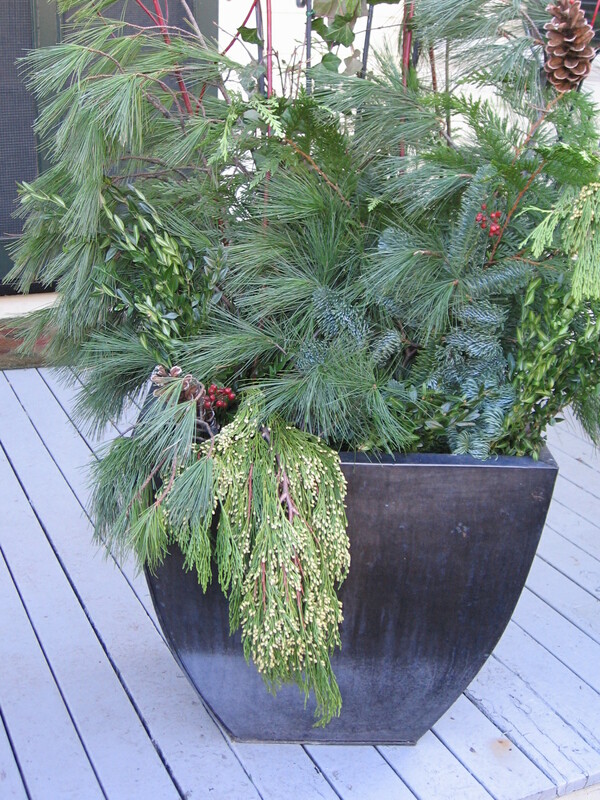 And (optional), to keep the foliage in your arrangements from drying out, spray the foliage with the anti-desiccant, Wilt Pruf or Wilt Stop to help seal in moisture (don’t spray juniper berries, cedar or blue spruce). Fresh greenery can be displayed outdoors in window boxes and containers, or as swags, garlands or wreaths; both outdoors or indoors. Indoor arrangements should be placed away from heat sources, lit candles, fireplaces, and sunny windows. Note: Poisonous berries are found on holly plants, yews, ivy plants, mistletoe, bittersweet, Jerusalem cherry and crown of thorns; so keep these plants and berries away from pets and young children.